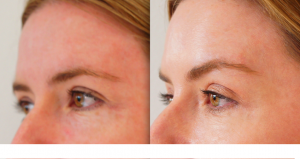 Brows and eyelids can start to droop and become heavier as the aging process begins. When your eyebrows start to lower it can make you look tired and older. Most women will definitely notice the drooping and heaviness of their upper eyelids while applying their eye make-up as the spaces between the eyelashes and eyebrows shorten. Up until recently we’ve only had one option – a surgical brow lift. This is still a great procedure but you will require down time to recuperate. Dr. Ellis at Lasting Looks Anti Aging and Laser Clinic offers a non surgical option to treat specific muscle groups in the forehead with Botox Cosmetic. Dr. Ellis can carefully inject Botox just in the muscles that pull down(depressor muscles) in the forehead area, which in turn give a lift to the brows. This can give the eyes a more open and refreshed look. Most people can expect up to 2 millimeters of lift, which sounds like a little but in the face is usually enough for a noticeable improvement. The full effect of your Botox treatment can be seen within 2 weeks. The effects of this type of treatment can last an average of 3-4 months .